Enduser's new album takes you for a ride somewhere between fury and harmony: "Pushing Back" is a perfect balance between Lynn Standafer's hard drum'n'bass and an intense, careful work with melodies and vocals. Featuring Nongenetic (of SShadow Huntaz), Kazumi, and none other than Jared Louche of Chemlab, and remixes by DJ Hidden and Bong-Ra, "Pushing Back" is a new album Enduser can be very proud of. A new major contribution to Enduser's growing discography, “Pushing Back” sees Lynn Standafer integrate new elements to his otherwise typical sound, and take its listener to a new memorable ride. An artist recognised as one of the most important of today breakcore and drum'n'bass scene, Enduser had long wished to release an album where his hard beats and sudden breaks would be presented together with specially recorded vocals and prominent melodies. This project finally sees the light of the day with “Pushing Back”, an album on which the listener gets both the heavily pounding beats of such tracks as the title track or the opening “Starting... now” as well as the vocal contribution of Kazumi (known for her work on Planet Mu and City Centre Offices), Shadow Huntaz's Nongenetic and Chemlab's Jared Louche. These three vocalists and their very different styles are all integrated seamlessly into Enduser's sounds, and join the remixes by label mates Bong-Ra and DJ Hidden on the surprisingly coherent patchwork that is “Pushing Back”, an album at the perfect meeting point between fury and harmony. Enduser's new album was written over a relatively long period for this prolific artist. 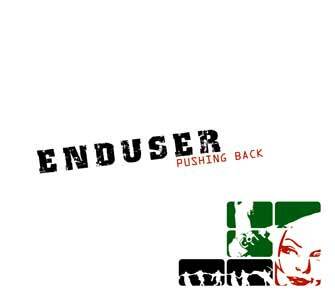 A special care to the details and the production has been given on “Pushing Back”, this album reflecting well Enduser's experience and progress along the years. Ad Noiseam is happy to present this new album which marks a decisive point in Enduser's career.